When it comes to laying your head to rest, Atlantis offers you several spectacular options. Atlantis, Paradise Island provides it's guests with a number of comfortable accommodation choices in a variety of price ranges. Although each hotel is designed differently to satisfy the specific desires of their guests, they are all designed to pamper. 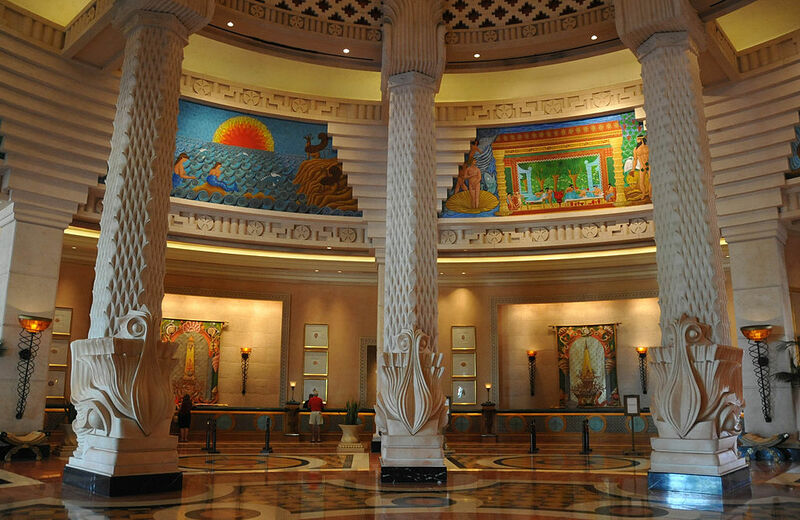 Staying at any of these hotels gives you full access to everything Atlantis offers. 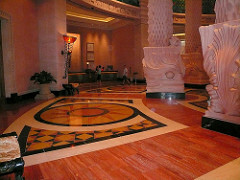 Royal Towers - Atlantis refers to the Royal Towers as their signature hotel. Appropriatly decorated with mythologically inspired decor. Guest Rooms are available with two queen or one king-size bed and offer a fully stocked service bar. Regal Suites includes a seperate parlor area with an additional half bath, two walk-in closets, an exquisite master bath and an optional full-size second guest room. To further the luxury, fresh flowers, robes and slippers are available. Grand Suites at the Royal Tower offer breath-taking water views with full balconies. These generously sized rooms also include a whirpool bath. 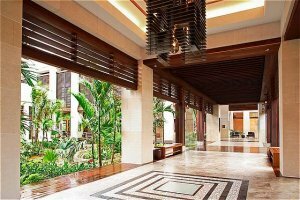 Coral Towers - The tropical setting of the Coral Towers helps you leave your cares behind. Festive and bright Bahamian colors gives it a casual, relaxed feel. Guest Rooms are spacious rooms with fully stocked service bars and full balconies. Available with either a king-size or two double beds. Regal Suites are given an elegant twist with a luxurious master bath and a seperate parlor area with a fold-out sofa bed. Beach Towers - Welcome to the Bahamas! This classic Caribbean background is welcoming and elegant, but offers the casual simplicity you want on your vacation. Beach Tower Guest Rooms feature tropical decor and convenient amenities. This is the least expensive of all Atlantis accommodations. The Cove Atlantis - My favorite place to stay on Paradise Island! Contemporary design and posh touches make this the grown up place to stay and play. Ocean Suites featuring ocean or partial ocean views offer generous floorplans. Oversized bathroom with marble floors, twin granite vanities and a shower big enough for two. The Deluxe Ocean Club Suites are located on the 20th through 22nd floors. You'll enjoy exclusive access to The Club Lounge where you can enjoy gourmet breakfasts, delicious hors d'oeuvres during the day and signature cocktails at night. Azure Suites spoil you with panoramic views of the ocean. King-size master bedroom and two walk-in closets for added comfort. Located on the tower's top five floors, these 1198-sq-ft rooms are like your own private haven. The Sapphire Suites offers the most incredible ocean views. The floor-to-ceiling windows and corner balconies give stunning a whole new meaning. Also, the master bathroom and oversized bathroom are seperated from the sitting area. Presidential Suite is just that, fit for a president. Setting the standard for luxury with more than 2750-sq-ft carefully designed on the tower's top floor. A grand balcony that extend the full width of the suite provides spectacular ocean views. Finally, the Penthouse Suites which offer a full 180-degree ocean view. Two-story vaulted ceilings and two master bedrooms and bathrooms. This 4000-sq-ft sanctuary is elegantly designed with luxurious world travelers in mind. The Reef Atlantis - This is the perfect place for making yourself feel at home. The excitement and wonderment of Atlantis is right on your doorstep. Studio retreats offer 523-sq-ft of living space. This resident-style nest is fully furnished with king-size beds, kitchen area, sleeper sofa and master bath. On-site laundry facilities are available. One Bedroom Suites range from 974 to 1195-sq-ft. Each of these spacious suites offer a king-size bedroom, two full baths, full kitchen are, washer & dryer and living room with sleeper sofa. You also have a breathtaking view from your private balcony. Harborside Resort - Perfect for groups with 4-9 people, Harborside's villas give you that home-away-from-home feeling with full privileges to Atlantis. There are Deluxe Villas, with one, two or three bedrooms. Containing jetted bathtubs, fully-equipped kitchen areas, king-size bedrooms and the two and three bedroom villas have a private washer & dryer. Expansive one and two bedroom Premium Villas are also available with a private terrace with table and chairs, full entertainment center, full kitchen as well as washers and dryers.